Starting in 1944 the University of Illinois conducted a number of studies of kitchen design and developed the fundamental design principles that are still very much in use. These days the National Kitchen & Bath Association updates and publishes these basic design standards. The NKBA Kitchen & Bathroom Planning Guidelines with Access Standards is a collection of illustrations and planning suggestions to aid professionals in the safe and effective planning of kitchens and bathrooms. These guidelines are excerpted from the National Kitchen & Bath Association Professional Resource Library Kitchen Planning and Bath Planning volumes. Designers and those interested in becoming kitchen and bath design professionals benefit by studying the complete body of knowledge found in the NKBA Professional Resource Library. These flexible and easy-to-understand guidelines were developed under the guidance of the NKBA by a committee of professionals. The committee completed in-depth historical reviews of planning guidelines dating back to 1920. The guidelines published in this booklet reflect a composite of the historical review, current industry environment, future trends, consumer lifestyles, new research, new building codes, and current industry practices; as well as a Kitchen Storage Research Project conducted by Virginia Polytechnic Institute. The "Universal Design Guideline Access Standard" is a relatively new addition to the guidelines. It defines the rules for kitchens intended for use by persons with less than full physical abilities. Get an official copy of the consolidated Kitchen & Bathroom Planning Guidelines. While these guidelines are a good start, they do not substitute for competent kitchen design. Design encompasses these rules and much more. It's the "much more" part that gets novice designers in trouble. A new kitchen is a major investment, and not something you are going to want to do over because the first design was not quite right. So, invest in a good design. It's money well spent. These are not the only kitchen design "rules". Designers, carpenters, cabinetmakers, plumbers, and electricians have worked out some rules of thumb over many years that may not rise to the level of "standards", but represent accepted practice proven over time to be effective. We have included these in notes and comments where applicable. Code Requirement: Refer to national building and access codes. Your local code authority may have modified or added to these national requirements. Universal Design Guideline: Refer to NKBA recommendations for universal design. ADA/ANSI Guidelines: Refer to Americans with Disabilities Act guidelines and recommendations published by the American National Standards Institute for universal design. These may or may not be mandated by local building codes, but are required in some federally subsidized housing. Notes: Remarks by the publishers of the rule or standard. Comments: Our own observations and clarifications. We use comments to introduce rules and guidelines from other sources as well as discuss our own experience with an application of these guidelines. Guideline: The clear opening of a doorway should be at least 32" wide. This requires a minimum 34" or 2'-10" door. Code Requirement: No national Code requirement. Check for local code requirements where you live. Universal Design Guideline: The clear opening of a doorway should be at least 34 inches. This would require a minimum 36" or 3'-0" door. Since a 34" (2-10) interior door is typically a special order, custom door, this standard is usually met with a 36" (3-0) standard door. A 36" opening for a narrow passageway requires a 38" door to meet the requirements of ANSI A117.1 404. These are not available except as custom doors — so narrow passageways should be avoided where possible. These standards have been around for a few years now, and the door industry has been slow to respond to the new door width requirements. The effect is minimal, however, since most kitchen designs are open plans with doorways, not doors, connecting them to adjoining rooms. Guideline: No entry door should interfere with the safe operation of appliances, nor should appliance doors interfere with one another. Universal Design Guideline: In addition, the door area should include clear floor space for maneuvering which varies according to the type of door and direction of approach. See ADA/ANSI Guidelines below. Comments: Door interference can be subtle. For example, we like to locate refrigerators and pantries at the edge of the kitchen so that snack-seekers can get what they want without crossing into the main, working part of the kitchen. However, there is a good risk that the door of a refrigerator located next to an entry door will block entry when the refrigerator door is open. If cabinets are improperly spaced, the doors of two adjacent cabinets may strike each other. In kitchen remodels, working within an existing space, such problems may be unavoidable. But, they should be avoided if possible. Guideline: In a kitchen with three work centers the sum of the three traveled distances should total no more than 26 feet with no single leg of the triangle measuring less than 4 feet nor more than 9 feet. Universal Design Guideline: The kitchen guideline recommendation meets Universal Design Guideline standards. When the kitchen plan includes more than three primary appliance/work centers, each additional travel distance to another appliance/work center should measure no less than 4' nor more than 9'. No work triangle leg may intersect an island/peninsula or other obstacle by more than 12". Comments: The concept of a kitchen work triangle does not work in every situation. For example, in a Pullman kitchen where the sink, cooking surface, and refrigerator are on one wall, no triangle of any kind is possible. Nonetheless, for most kitchens, it remains a valuable gauge of how well a kitchen design is likely to function. Cabinets, more than any other item, determine the style of a kitchen. Flooring, fixtures, lights, appliances and evenworkflows are important, but the cabinets define the kitchen's look and function. Because they play such a large role in your kitchen's design, it pays to learn as much as possible about the range of cabinet options. This means looking beyond style - although the style is important - to structure, finishes, hardware, and accessories. To learn all about kitchen cabinetry, go to Cabinet Basics, Part 1: An Introduction to Cabinets. Comments: Clearly this rule is an ideal standard for new kitchens. But, in a great many existing kitchens built before 1970, the kitchen is also a hallway leading to the back door or basement. The major traffic pattern is straight through the heart of the kitchen work triangle. Unless significant alterations are made to the structure of the house, there is usually little that can be done about it. If possible, however, locate the sink and range or cooktop out of the traffic path. If the refrigerator is in or adjacent to the path, it does little harm. Quite often the aisles in the kitchen triangle can be widened by adjusting the depth of adjacent cabinets, but not below 21". Guideline: The width of a work aisle should be at least 42" for one cook and at least 48" for multiple cooks. Measure between the counter front­age, tall cabinets and/or appliances. Universal Design Guideline: Kitchen guideline recommendation meets Universal Design recommendation. See Code References for specific applications. In a U-shaped kitchen, plan a minimum clearance of 60" between opposing arms. (ANSI A117.1 804.2.2, 1003.12.1.2). Include a wheelchair turning space with a diameter of at least 60", which can include knee* and toe* clearances. (ANSI A117.1 304.3.1). A wheelchair turning space could utilize a T-shaped clear space, which is a 60" square with two 12" wide x 24" deep areas removed from the corners of the square. This leaves a minimum 36" wide base and two 36" wide arms. T-shaped wheelchair turning spaces can include knee and toe clearances. (ANSI A117.1 304.3.2). Knee clearance must be a minimum 30" wide (36" to use as part of the T-turn) and maintain a 27" clear space under the cabinet, counter or sink for a depth of 8". The next 3" of depth may slope down to a height of 9", with a clear space of at least 17" extending beneath the element. (ANSI 306.3). Toe clearance space under a cabinet or appliance is between the floor and 9" above the floor. Where toe clearance is required as part of a clear floor space, the toe clearance should extend 17" minimum beneath the element. (ANSI A117.1 306.2). There is a great deal of confusion over the distinction between a walkway and a work aisle. A work aisle is where a person stands while working in the kitchen. A walkway is a passageway through the kitchen. Especially is older kitchens, the work aisle and walkway may be combined and be used both for work and for traversing the kitchen. In such a case, the minimum width of the combined walkway/work aisle should be 48" where possible. Guideline: The width of a walkway should be at least 36". Universal Design Guideline: If two walkways are perpendicular to each other, one walkway should be at least 42" wide. Especially is older kitchens, the work aisle and walkway may be combined and be used both for work and for traversing the kitchen. In such a case, the minimum width of the combined walkway/work aisle should be 48", where possible. Guideline: In a seating area where no traffic passes behind a seated diner, allow 32" of clearance from the counter or table edge to any wall or other obstruction behind the seating area. Allow at least 36" to edge past. Allow at least 44" to walk past. Plan a minimum of 60" to allow passage for a person in a wheelchair. Universal Design Guideline: In a seating area where no traffic passes behind a seated diner, allow 36" of clearance from the counter/table edge to any wall or other obstruction behind the seating area. A 32" clearance is almost never appropriate. It can only work in a seating area that has just one seat. If there are two seats, however, then the user of the second seat will have to pass behind the user of the first seat to get to the second seat, and the 36" clearance rule applies to allow the second person to edge past. A 44" clearance is better, if room is available. A seating area should never extend into a work aisle but may extend into a walk area if a minimum walk space of 44" is provided. This allows a walker to pass behind the seated diners. A 60" space is better, and required for wheelchair access. For 30" high tables/counters, a minimum 18" deep clear knee space for each seated diner. For 36" high counters, a minimum 15" deep clear knee space for each seated diner. For 42" high counters, a minimum 12"deep clear knee space for each seated diner. Kitchen seating areas should be 28" — 34" high x 30" — 36" wide x 19" deep to better accommodate people of various sizes or those using a mobility aid. Recommended minimum size for a knee space at a table or counter is 36" wide x 27" high x 19" deep. Measure knee space from the front edge of the table or counter. While a 24" wide space for each diner is workable, it is not very comfortable. A 28-30" wide space is better and should be considered the minimum where space is available. Universal Design Guideline: Plan knee spaces at the sink to allow for a seated user. Recommended minimum size for a knee space is 36" wide x 27" high x 8" deep, increasing to 17" deep in the toe space, which extends 9" from the floor. Insulation for exposed pipes should be provided. The sink should be no more than 34" high or adjustable between 29" and 36". (ANSI 117.1.1002.4.2). The sink bowl should be no more than 6 1/2" deep (ANSI 117.1 1002.12.4.3). Exposed water supply and drain pipes under sinks should be insulated or otherwise configured to protect against contact. There should be no sharp or abrasive surfaces under sinks. (ANSI A117.1 606.6). Comments: In a pullman kitchen in which the entire kitchen is placed against one wall, the sink must necessarily be located between the cooktop and refrigerator. This rule allows no other placement. Guideline: Include at least a 24" wide landing area [Note C] to one side of the sink and at least an 18" wide landing area on the other side. Note A: If all of the countertop at the sink is not the same height, then plan a 24" landing area on one side of the sink and 3" of countertop front­age on the other side, both at the same height as the sink. Note B: The 24" of recommended landing area can be met by 3" of countertop front­age from the edge of the sink to the inside corner of the countertop if more than 21" of countertop front­age is available on the return. Note C: Landing area is measured as countertop front­age adjacent to a sink and/or an appliance. The countertop must be at least 16" deep and must be 28" to 45" above the finished floor to qualify. Kitchen guideline recommendation meets Universal Design standards. In Universal Design, it is not uncommon for the cabinet containing the sink to be lower than the adjacent cabinets. Hence the standard in Note A that allows the landing area to be at a different level than the sink countertops as long as there is at least 24" of same-level countertop space on one side of the sink. Guideline: Include a section of continuous countertop at least 30" wide x 24" deep immediately next to a sink for a primary preparation/work area. Universal Design Guideline: A section of continuous countertop at least 30" wide with a permanent or adaptable knee space should be included somewhere in the kitchen. 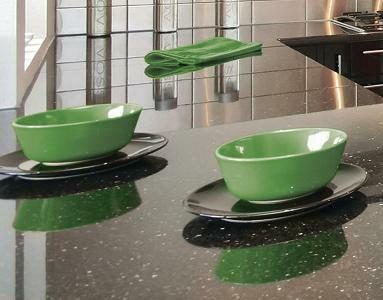 Comments: There are very limited circumstances under which the countertop next to a sink should be less than 30" wide. If the countertop is deeper than the standard 25", the minimum width should, nonetheless, remain 30". As a practical matter, it is sometimes necessary to decrease the depth of the countertop (never to less than 21"). If this is the case, increase the width of the countertop work area to 36". Guideline: Locate nearest edge of the primary dishwasher within 36" of the nearest edge of a cleanup and prep sink. Note A: Provide at least 21"* of standing space between the edge of the dishwasher and countertop front­age, appliances and/or cabinets, which are placed at a right angle to the dishwasher. Note B: *In a diagonal installation, the 21" is measured from the center of the sink to the edge of the dishwasher door in an open position. Universal Design Guideline: Raise dishwasher 6" — 12" when it can be planned with appropriate landing areas at the same height as the sink. Comments: The modern dishwasher is an ergonomic disaster. It's much too hard to use. You have to bend and stoop a lot to load and unload it. You have to spend a lot of time opening and closing the top tray to reach the bottom tray. The bottom-hinged drawer gets in the way of people moving around the kitchen and makes it much harder for mobility impaired users to load and unload. It is not a very user-friendly or efficient appliance. The solution is to raise the dishwasher off the floor so that the center of the appliance is about waist high. In kitchens where it is possible, that's what we do. The new drawer-style dishwashers are a vast improvement, but as of yet, very pricey. For more information on dishwasher placement, see Mise-en-Place: What We Can Learn About Kitchen Design from Commercial Kitchens. For more information about ergonomic kitchen design, see Body Friendly Design: Kitchen Ergonomics. Guideline: Include at least two waste receptacles. Locate one near each of the cleanup and prep sinks and a second for recycling either in the kitchen or nearby. Universal Design Guideline: Kitchen guideline recommendation meets Universal Design Standard. Guideline: At least 3" of countertop front­age should be provided on one side of the auxiliary sink, and 18" of countertop front­age on the other side, both at the same height as the sink. Universal Design Guideline: Plan knee spaces at, or adjacent to, the auxiliary sink to allow for a seated user. Recommended minimum size for a knee space is 36" wide x 27" high x 8" deep, increasing to 17" deep in the toe space, which extends 9" from the floor. Insulation for exposed pipes should be provided. 15" of landing area above or adjacent to any undercounter style refrigeration appliance. Universal Design Guideline: See ADA/ANSI Guidelines. comments: Because the doors on a side-by-side refrigerator are always in the way of loading from either side of the appliance, the best choice of landing zone is on a countertop across from the refrigerator. If this is not possible, start the landing zone at the edge of the door in its fully open position, then add a minimum of 15" of clear countertop for the actual landing area. Guideline: Include a minimum of 12" of landing area on one side of a cooking surface and 15" on the other side. Note A: The 12" and 15" landing areas must be at the same height as the cooking surface. Note B: For safety reasons, in an island or peninsula situation, the countertop should also extend a minimum of 9" behind the cooking surface if the counter height is the same as the surface-cooking appliance. Note A is ambiguous. Surfaces adjacent to a cooktop or range are almost never exactly at the same level as the cooking surface. The guideline is met if the adjacent surface is roughly at the same level as the cooking surface. The purpose of the guidelines for cooking surface landing areas is not just ensuring enough working space on both sides of the cooking appliance, but to ensure that there is a sufficient space between the cooking appliance and any combustible cabinet materials for safety. Most safety codes require that a cooking surface next to a door be separated from the doorway by at least 12" of countertop. We have always interpreted this to mean 12' from the flammable door trim. Universal Design Guideline: Lower the cooktop to 34" maximum height and create a knee space beneath the appliance. Guideline: Allow 24" of clearance between the cooking surface and a protected noncombustible surface above it. 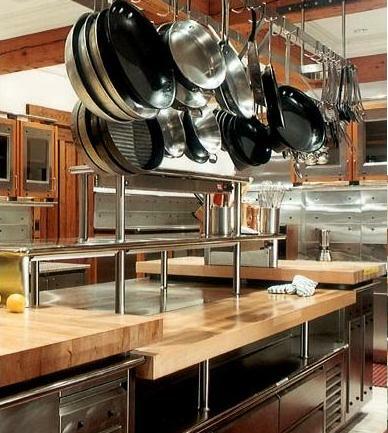 At least 30" of clearance is required between the cooking surface and an unprotected/combustible surface above it. (IRC M 1901.1). This rule must be coordinated with Rule 19. Most often, the item installed above a range or cooktop is a range hood or microwave/hood combination. In all cases, the minimum clearance specified by the appliance's installation instructions should be followed rather than this rule if the manufacturer's recommended minimum clearance is greater. If the manufacturer's clearance guidelines are less than the clearance required by this rule, the conservative, and better, approach is to use the greater clearances specified here. The exception occurs where the clearance specified here exceeds the manufacturer's maximum clearance, in which case the manufacturer's clearance specification should be used. Manufacturer's specifications must be followed. (IRC G 2407.1, IRC G 2447.1). The minimum required exhaust rate for a ducted hood is 100 cfm and must be ducted to the outside. (IRC M 1507.3). Make-up air may need to be provided. Refer to local codes. (IRC G 2407.4). Universal Design Guideline: Ventilation controls should be placed 15" — 44" above the floor, operable with minimal effort, easy to read and with minimal noise pollution. Operable parts should be operable with one hand and not require tight grasping, pinching or twisting of the wrist. The force required to activate operable parts should be 5 pounds maximum. (ANSI A117.1 309.4). Where a forward or side reach is unobstructed, the high reach should be 48" maximum and the low reach should be 15" minimum above the floor. (ANSI A117.1 308.2.1 and 308.3.1). Formerly it was permissible in most jurisdictions to recirculate vented air back into the kitchen. The air was drawn into the ventilating device through carbon filters, then blown back into the kitchen. Recirculation is now not allowed in most jurisdictions. Air must be vented through and wall or the roof to the outdoors. The earlier practice of venting into the attic is also no longer allowed due to the risk of fire. Generally, the specifications provided by the manufacturer of the ventilation device or system must be followed, even if they conflict with other building Code Requirements. Where the manufacturer's specifications are silent, then guidance is to be obtained from the applicable building Code Requirement. Typically make-up air is required when the capacity of the ventilation system exceeds 300 cfm. The belief is that at this capacity the house can no longer provide enough air and there is a danger of back-drafting gas appliances. Makeup air is merely air drawn from outside the dwelling through ducting that is installed by a mechanical contractor. Comments: While there are no national building Code Requirements, it is very likely that a fire extinguisher in your kitchen is mandated by your local building or fire code. Universal Design Guideline: Place fire extinguisher between 15" and 48" off the finished floor. Put the fire extinguisher in plain view even if you don't like the "industrial look." National Fire Protection Association (NFPA) Guideline 10, Paragraph 6.1.3.1 states, "Extinguishers shall be conspicuously located where they will be readily accessible and immediately available in the event of a fire." Paragraph 6.1.3.3.1 states, "Fire extinguishers shall not be obstructed or obscured from view." A kitchen fire extinguisher must be rated for class K fires. These are fires fueled by flammable liquids and grease. Most fire extinguishers are rated for class K fires, but check to be certain. When you install your fire extinguisher, read the instructions for using it to fight fires. Stopping to read the instructions while a fire is blazing is not a good idea, but using it without reading the instructions is an even worse idea. Test your extinguisher at least every 6 months, more often if the manufacturer recommends a shorter interval, to make sure it is still charged and functioning. If it is not functioning, recharge or replace it. Guideline: Locate the microwave oven after considering the user's height and abilities. The ideal location for the bottom of the microwave is 3" below the principal user's shoulder but no more than 54" above the floor. If the microwave oven is placed below the countertop the oven bottom must be at least 15" off the finished floor. The current guidelines do not address drawer-type microwaves. These are intended to be mounted under the countertop and are accessed from the top, not from the front. Until guidelines are developed, the best course is to carefully follow the manufacturer's instructions for placement and mounting. Over-the-range micro-hoods will need to follow the guideline for locating a range hood in Rules 18 and 19 above, as well as this rule. If there is a conflict, the guidelines of Rules 18 and 19 supersede this rule. Universal Design Guideline: Locate the microwave controls above 15" and below 48". Comments: This guideline is a little vague when it comes to controls that have a vertical dimension, such as a keypad, but the illustrations that accompany the guideline seem to suggest that the entire pad should be below 48". Guideline: Provide at least a 15" landing area above, below, or adjacent to the handle side of a microwave oven. Universal Design Guideline: Provide a landing area in front of or immediately adjacent to the handle side of the microwave. Comments: Typically there is a countertop near the microwave that will serve as a landing zone. However, if the microwave is located in a tall oven cabinet, it may be necessary to provide a landing area. If necessary, a pull-out shelf located under the microwave will work provided it is strong and stable enough to hold a minimum of 25 lbs. Include at least a 15" landing area next to or above the oven. At least a 15" landing area that is not more than 48" across from the oven is acceptable if the appliance does not open into a walkway. Comments: An oven in a range has to share the landing zone on one side of the range. One interpretation of Rule 24 (see below) is that the combined landing zone has to be 27" or larger. We think the proper interpretation is that the range/oven is one appliance, so the Rule 24 combination guideline does not apply. Landing zones surrounding range/oven combinations are adequately provided for by Rule 17 which requires a minimum of 27" divided between both sides of the appliance, with a minimum of 15" on one side. Guideline: If two landing areas are adjacent to one another, determine a new minimum for the two adjoining spaces by taking the larger of the two landing area requirements and adding 12". An oven in a range has to share the landing zone on one side of the range. One interpretation this guideline is that the combined landing zone has to be 27" or larger. We think the proper interpretation is that the range/oven is one appliance, so this guideline does not apply. Landing zones surrounding range/oven combinations is adequately provided for by Rule 17 which requires a minimum of 27" divided between both sides of the appliance, with a minimum of 15" on one side. Guideline: A total of 158" of countertop front­age, 24" deep, with at least 15" of clearance above, is needed to accommodate all uses, including landing area, preparation/work area, and storage. A countertop takes a lot of abuse. We put hot pans on it, cut on it, scrape and scratch at it, scour it, and spill hot liquids on it. Yet after years of abuse, your countertop is expected to look as good as ever — and mostly they do. Learn about some of the common and uncommon materials available for countertop at New & Traditional Countertop Choices. Notes: Built-in appliance garages extending to the countertop can be counted towards the total countertop front­age recommendation, but they may interfere with the landing areas. Universal Design Guideline: At least two work-counter heights should be offered in the kitchen, with one 28"— 36" above the finished floor and the other 36"— 45" above the finished floor. Any countertop at least 24" deep can be counted. Almost all standard countertops meet this requirement — most are 25" deep. If a countertop is shallower than 24", then, according to this Rule, it does not count toward the 158" of countertop front­age. However, in remodeling older kitchens, shallow countertops are often required to meet the 42" and 48" work-aisle requirements of Rule 6. This is where the designer's experience and good judgment comes into play in making the trade-off. We generally count any countertop at least 21" deep but less than 24" as 2/3rds. So, 3' of 21" countertop would count as 2' of countertop front­age. The countertop is measured along its front edge, so inside corners do not count toward the minimum counter space specified in this guideline. The guideline allows counting the countertop in front of appliance garages and other similar storage that rests on the countertop, even though this reduces the usable countertop area to as little as 13". The guideline is not clear how island countertops are to be counted. Do you count just the one side or both sides? If the countertop is accessible from both sides, we count both sides, but not the ends. Although the guideline does not distinguish between inside and outside corners, it is clear that the recommendation applies only to outside corners. The guideline does not provide a minimum radius for rounded corners. On a 1" overhang countertop — the typical overhang — the largest radius possible is about 2". 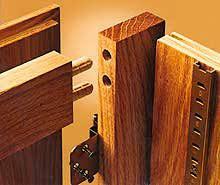 Corners may be clipped (the more common term is "chamfered") or rounded ("filleted"). Both options meet the guideline. 2000" for a large kitchen (greater than 350 square feet). Every kitchen needs a pantry. A well-stocked pantry is required for good domestic management. Whatever the size of your kitchen, it should include a convenient place to store groceries, and this critical storage requires careful thought and planning. 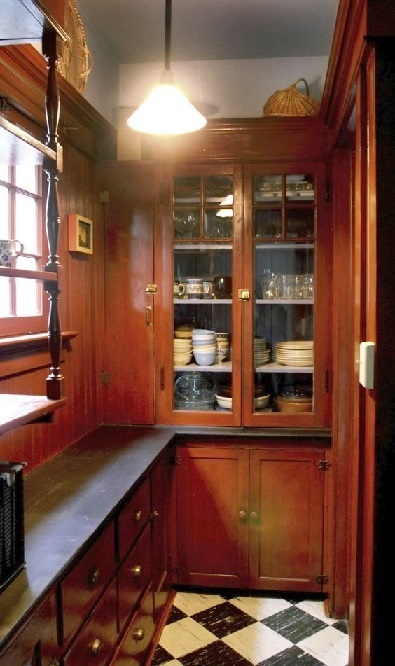 Whether it is a simple as a single cabinet or as elaborate as a traditional butler's pantry, to provide convenient and accessible storage, all pantries must follow a simple set of iron-clad design rules. To learn how to design the perfect pantry, go to Pantry Perfect: The "Can't Go Wrong" Pantry Design Rules. Universal Design Guideline: Plan storage of frequently used items 15" to 48" above the floor. Shelf and drawer front­age is determined by multiplying the cabinet size by the number and depth of the shelves or drawers in the cabinet, using the following formula: Cabinet width in inches x number of shelf and drawers x cabinet depth in feet (or fraction thereof) = shelf and drawer front­age. The recommended distribution for the shelf and drawer front­age in inches is shown in the table at left. The totals for wall, base, drawer, and, pantry shelf­/­ drawer front­age can be adjusted upward or downward as long as the recommended total stays the same. Do not apply more than the recommended amount of storage in the miscellaneous category to meet the total front­age recommendation. Storage areas that are more than 84" above the floor must be counted in the miscellaneous category. Storage/organizing items can enhance the functional capacity of wall, base, drawer and pantry storage and should be selected to meet user needs. Comments: This design guideline is badly out of date. The whole notion of minimum shelf and drawer front­age is an attempt to quantify functionality that is not readily quantifiable. While the calculation may serve the need to have some math problems on the various NKBA certification examinations, it has little real-world utility because it does not take into account the trend over the past twenty years of moving away from shelving in lower cabinets and toward drawers; nor does it distinguish between accessible and inaccessible storage. Any storage more than 78" from the floor. Often the difference between a successful kitchen that is both beautiful and easy to work in is the design of the kitchen's storage. Cabinetry layout and configuration is an important part of the storage design but it is not the whole story. We have found that the best model for successful storage design is the commercial kitchen. Restaurant kitchens are designed for maximum efficiency and ease of preparing hundreds of appetizing meals in a very short time. Not every feature of a commercial installation works in a home kitchen, but many do. To discover the secrets of commercial kitchens, go to Mise-en-Place: What We Can Learn About Kitchen Design from Commercial Kitchens. A 24 inch-deep base cabinet with two shelves has the following front­age: 24" x 2' x 2 = 96 inches. A 24 inch-deep base cabinet with two drawers has the same front­age: 24" x 2' x 2 = 96 inches. All of the drawer space is accessible storage. To reach the back 12", just pull the drawer out. But, only the front 12" of the shelves in base cabinets is useful storage, the back 12" is inaccessible. Treating the two storage modalities as if they provided the same amount of useful storage is misleading. The drawers are more useful storage and their higher utility should be accounted for in calculating minimum front­age. In our calculations, we score inaccessible storage at only 1/2 the value of accessible storage. 24" × 1' × 2 shelves = 48" of front­age. 24" × 1' × 2 shelves / 2 = 24" of front­age. 48" + 24" = 72". The base cabinet with drawers retains its original front­age of 96". Now the comparison of front­age scores clearly shows the drawer cabinet to be more useful storage. at least 560" for a large kitchen (more than 350 sq. ft.). Notes: This guideline does not apply if there are no corner cabinets. Off the Wall Kitchens: Living Without Upper Cabinets. Solving Corner Cabinet Woes (Sidebar). Universal Design Guideline: Lighting controls should be placed 15" — 44" above the floor, operable with minimal effort, easy to read and with minimal noise pollution. Where a forward or side reach is unobstructed, the high reach should be 48" maximum and the low reach should be 15" minimum above the floor. (ANSI A117.1 308.2.1 and 308.3.1). Comments: For more information on the structural components of the kitchen; the piping, heating and cooling, electricity and lighting, see Behind the Scenes - The Hidden Kitchen. Because it typically opens for business before dawn and closes long after sunset, a kitchen uses a lot of energy for lighting. That makes this room an important place to use efficient lighting. While remodeling your kitchen, you have the perfect opportunity to create an effective but also highly efficient lighting system. Designing a lighting system that provides just the right light yet uses very little electricity is the goal of lighting design. It is not a trivial process. And it requires an intimate understanding of how light works. To learn about light and lighting design, go to Designing Efficient & Effective Kitchen Lighting. At least one wall-switch-controlled light must be provided. Switch must be placed at the entrance. (IRC E 3803.2). Code Requirement: The requirement that a light switch should be placed at "the entrance" to a kitchen is often interpreted by code inspectors to require a switch at each and every entrance. The height and position of switches are governed in most jurisdictions by the National Electrical Code. 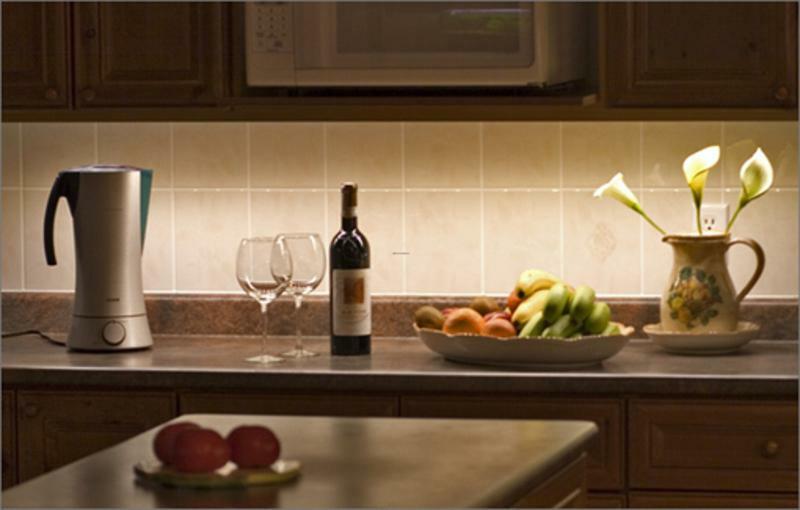 For more information on kitchen lighting, see Designing Efficient and Effective Kitchen Lighting. Do you know the pantry design guidelines?